This is a question that is asked quite frequently, and before the new user profile page was released – you were forced to build your own database query on a specific site. Luckily that’s not needed anymore, since you can find the progression in the user interface, even if it’s kind of hidden with a small gray gear icon. Go to your user profile page (click the top bar with your username on it) and click the little gear icon to the right of the Next Badge element. Once there, on the top left of the modal dialogue, you can filter by available, all, gold, silver and bronze. At first you’ll see the badges you’ve already have been awarded and then one with less effort (?) to get next. Check it out and leave the database scripting to the SE-employee. 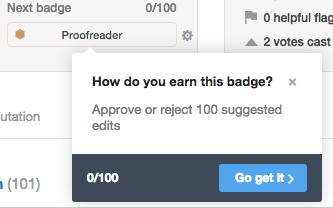 Not every badge includes this feature, but those that do attempt to point you to a place you can make progress. For instance, the Proofreader button points to the suggested edit review queue. Generally, the recommended next badge is the one you've made the most progress toward completion. So if you've rep capped 45 out of 50 days for Epic and 80 out of 100 consecutive days needed for Fanatic, we'll recommend Epic first. For most people, visiting the site 20 more times will be easier than getting 200+ reputation for 5 days, but we just compare 90% completion to 80% and recommend the badge you've made more progress on. Finally, we have a separate bar on the left side for tracking privilege levels. Once you max that out (and we hope to open this feature to everyone) it's possible to track tag badges. These are especially interesting since they demonstrate your expertise in a narrow portion of the site's overall topic. This section originates from the answer to the same "question" on SP.SE. Would it be too much to include all the badges progress from the ones found here https://ux.stackexchange.com/help/badges? For the badges like Great Question you could just list the question with the closest value to complete like 73/100. Not the answer you're looking for? Browse other questions tagged discussion faq badges . How many notifications are there on StackExchange? The menubar for the text edit box is inconsistent across SE sites - does it matter? Graph shows over reputation cap?